Walter David Jones CH, CBE (known as David Jones, 1 November 1895 – 28 October 1974) was both a painter and one of the first-generation British modernist poets. As a painter he worked chiefly in watercolour, painting portraits and animal, landscape, legendary and religious subjects. He was also a wood-engraver and designer of inscriptions. As a writer he was considered by T. S. Eliot to be of major importance, and his work The Anathemata was considered by W. H. Auden to be the best long poem written in English in the 20th century. Help in forming his work came from his Christian beliefs and Welsh heritage. Jones was born on 1 November 1895 in Arabin Road, Brockley, Kent, now a suburb of South East London, and later lived in nearby Howson Road. His father, James Jones, had been born in Flintshire in north Wales, to a Welsh-speaking family but was discouraged from speaking Welsh by his father, who, in common with many Welsh-speaking parents of the time, believed that habitual use of the language might hold his child back in his career. James Jones had moved to London to work as a printer's overseer for the Christian Herald Press, and it was here that he had met his wife, Alice, a Londoner born and bred. They had three children: Harold (who died at nineteen of tuberculosis), Alice, and David. Jones exhibited artistic promise at an early age, even entering his drawings into exhibitions of children's artwork. He wrote that from the age of six he knew that he would devote his life to art. In 1909, at fourteen, he persuaded his parents to allow him to abandon traditional education for art school and entered the Camberwell Art School. There he studied under A.S. Hartrick, who had worked with Van Gogh and Gauguin, Reginald Savage and Herbert Cole, and who introduced him to the work of the Impressionists and Pre-Raphaelites. At Camberwell it was mandatory to study English Literature, and in addition to his art studies Jones also developed his knowledge of literature. With the outbreak of the First World War, Jones enlisted with the Royal Welch Fusiliers and served on the Western Front from 1915 to 1918 with the 38th (Welsh) Division. His experiences in the trenches were to prove important in his later painting and poetry, especially his involvement in the fighting at Mametz Wood. The consequences of this long period in the trenches on Jones's health were slow to emerge. In 1919 he won a Government grant to study again at Camberwell Art School. From Camberwell, he followed its headmaster, Walter Bayes, to the Westminster School of Art in central London, where he studied under Bayes and Bernard Meninsky. The school was close to Westminster Cathedral, which Jones often visited to participate in Mass and to view the Stations of the Cross by Eric Gill. In 1921 he became a Roman Catholic and in 1922 he joined Eric Gill's Guild of St Joseph and St Dominic at Ditchling, Sussex, but not as a guild member. There Desmond Chute taught him to engrave in wood. In 1923 he first worked as an illustrator, for The Game published by Gill and H. Pepler. He returned to London in 1924, but in 1925 often visited Gill at Capel-y-ffin and the Benedictines at Caldey Island, near Tenby, and in the same year did illustrations for Gulliver's Travels for the Golden Cockerel Press. In 1927 Jones returned to live full-time with his parents at Brockley, although he continued to move between Capel and Caldey, as well as spending time on the coast at Portslade near Hove. He was painting prolifically during this period, and exhibited seascapes and drawings of Wales at the St George's gallery. He also joined the Society of Wood Engravers. The following year he visited Salies-de-Béarn, in France with the Gills. In 1929 he exhibited at the Goupil gallery, including watercolor landscapes of France. From 1928 to 1935 he was a member of the Seven and Five Society, becoming well acquainted with Ben and Winifred Nicholson, Jim Ede and many of the artists and collectors that were associated with the group. In 1932 the underlying stresses and memories from his time in trenches, and which were revisited in the course of writing and creating the first draft of In Parenthesis, took a heavy toll and Jones suffered a severe nervous breakdown. This prevented him from painting for several years, and delayed publication of In Parenthesis. Jones's works were shown at Chicago in 1933, the Venice Biennale in 1934 and the World's Fair, New York, in 1939. In 1937 Faber published, In Parenthesis, the epic poem based on his first seven months in the trenches. The following year it won the Hawthornden Prize, at the time the only important British literary award. In 1944 an exhibition of his art work toured Britain. In 1947 he suffered a second nervous breakdown while staying with Helen Sutherland at Cockley Moor, and he underwent treatment in a nursing home near Harrow. He left the nursing home stronger in body and spirit – recovering through therapy in which he was encouraged to paint and draw as part of the healing process. In 1952 Jones published The Anathemata, a dramatic-symbolic anatomy of Western culture. In 1954 an Arts Council exhibition of his work toured Britain, visiting Aberystwyth, Cardiff, Swansea, Edinburgh and the Tate Gallery in London. In 1974 he published The Sleeping Lord, a collection of short and mid-length poems. He had been frail and in ill-health for at least a decade, and he died in Harrow, Middlesex, in 1974. His grave can be found in Ladywell and Brockley Cemetery. After the war, Jones entered the Westminster School of Art, where he developed an interest in Post-Impressionism and studied under the British artist Walter Sickert, among other influential teachers. He also became increasingly attracted by Roman Catholicism, and in 1921 he converted, choosing "Michael" as his confirmation name. The priest who received Jones into the Church, Father John O'Connor (in fact the model for G. K. Chesterton's Father Brown character), suggested that he contact the Catholic artist Eric Gill. Gill ran the Guild of St Joseph and St Dominic, based on the medieval guild model, in Ditchling, Sussex. Jones joined the guild and learned wood and copper engraving as well as experimenting with wood carving. Jones soon began producing book illustrations for the St. Dominic's Press, and he would later illustrate for the Golden Cockerel Press, for which he engraved the Cockerel itself in 1925. Gill split with the Guild of SS. Joseph and Dominic and moved with his family and some followers to Capel-y-ffin in southern Wales, to pursue a rural way of life. Jones spent much of the years 1924 to 1927 visiting the Gills and assorted hangers-on in a rambling former monastery there. He had already become engaged to Gill's middle daughter, Petra, whose long neck and high forehead continued as standard female features in Jones's artwork for the rest of his career, even though his engagement to her ended in 1927. Jones continued living in his family home in Brockley until the mid-1930s and some of his paintings depict the house and garden. Jones's major illustrated books include wood engravings produced for editions of The Book of Jonah, The Chester Play of the Deluge, Aesop's Fables and Gulliver's Travels as well as for a Welsh translation of the Book of Ecclesiastes, Llyfr y Pregethwr. He produced an important group of copperplate engravings for an edition of The Rime of the Ancient Mariner. He also executed commissions for one-off engravings such as his illustration for T. S. Eliot's The Cultivation of Christmas Trees. He professed great disappointment in the way that his illustrations for Gulliver's Travels had been subsequently hand-coloured by art students, and complained about the too-light reproduction of the wood engravings for The Chester Play of The Deluge. Jones gave up engraving because of eye strain. As a painter, his style changed over time from more free water colour landscapes, still lifes, and portraits to a unique mixture of pencil and water colour resulting in dense and busy works full of symbolism. His best-known paintings include early seascapes such as Manawydan's Glass Door and later works on legendary subjects, such as Trystan ac Esyllt (Tristan and Iseult). He is also much admired for a genre that he invented later in life, which he termed "painted inscriptions", and these exert a continuing influence on calligraphers. Although he had been trying to write about his wartime experiences since 1928, it was not until 1937 that Jones published his first literary treatment of the conflict. In Parenthesis, which was published by Faber and Faber with an introduction (in 1961) by T. S. Eliot, is a mixture of verse and prose-lines but the rich language establishes it as poetry, which is how Jones himself considered it. Jones's literary debut won praise from critics and from fellow-poets such as Eliot and W.B. Yeats, as well as garnering the Hawthornden Prize in the following year. Jones's style can be described as High Modernism; the poem draws on literary influences from the 6th-century Welsh epic Y Gododdin to Thomas Malory's Morte d'Arthur to the poetry of Gerard Manley Hopkins and Anabase by St. John Perse (translated by Eliot) to try to make sense of the carnage he witnessed in the trenches. An extract from In Parenthesis read by Jones himself in 1967 appears on the audiobook CD Artists Rifles. His next book, The Anathemata, appeared in 1952 (again published by Faber). Inspired in part by a visit to Palestine during which he was struck by the historic parallels between the British and Roman occupations of the region, the book draws on materials from early British history and mythology and the history and myths of the Mediterranean region. The poem received largely positive reviews and was acclaimed by writers such as Herbert Read, W. H. Auden, Kathleen Raine and William Carlos Williams. Douglas Cleverdon produced dramatised readings of In Parenthesis and The Anathemata for the BBC Third Programme. Until 1960, Jones worked on a long poem, of which The Anathemata was intended to form part. Sections of the work were published mainly in the magazine Agenda, and in 1974 were published as The Sleeping Lord and Other Fragments (again by Faber). A posthumous volume of previously-unseen materials was edited by Harman Grisewood and René Hague and published by Agenda Editions as The Roman Quarry. On 11 November 1985, Jones was among sixteen Great War poets commemorated on a slate stone unveiled in Westminster Abbey's Poets' Corner. The inscription on the stone was written by a fellow Great War poet, Wilfred Owen. It reads: "My subject is War, and the pity of War. The Poetry is in the pity." In 2002, the text of three short poems was published for the first time in Wedding Poems, edited by Thomas Dilworth. Two of these poems ("Prothalamion" and "Epithalamion", amounting to 271 lines) had been written while Jones was living in London during the Blitz, for the marriage of Harman Grisewood to Margaret Bailey. The third poem, "The Brenner" (24 lines), had been written on 18 March 1940 to mark the meeting of Benito Mussolini and Adolf Hitler on the Brenner Pass. According to their editor publication of these poems brought into print "all the known completed poetry by David Jones". Jones wrote a number of essays on art, literature, religion and history. He wrote introductions for a few books such as a new edition of George Borrow's Wild Wales; he gave radio talks on the BBC Third Programme; he even tried his hand at an extended consideration of Coleridge's poem for a reprinting of The Rime of the Ancient Mariner featuring his own introduction and illustrations with a series of copper engravings. His essays were published in two collections, Epoch and Artist (Faber, 1959) and The Dying Gaul – another posthumous volume edited by a close friend and published by Faber in 1978. The most thorough exposition of David Jones's views on aesthetics and culture is his essay, "Art and Sacrament" (included in Epoch and Artist), which explores the meaning of signs and symbols in everyday life, relates them to Roman Catholic teachings such as the dogma of transubstantiation, and argues that human beings are the only animals which create "gratuitous" works, thus making them creators analogous to God. The best summary of these views is his short essay "Use and Sign" (in The Dying Gaul). David Jones was a complex artist and his achievements are unusual, if not unique, in that he created admired and generally recognised important works both in the field of poetry and in the visual arts. However, according to the poet and critic Kathleen Raine, despitethe supreme quality of his art... he has never at any time been a widely-read, still less a fashionable, writer, nor is he ever likely to become so for his work is too subtle and learned for popular tastes (Sewanee Review, 1967). In 1938 T. S. Eliot called In Parenthesis a 'work of genius', and Graham Greene, in 1980, "among the great poems of the century". 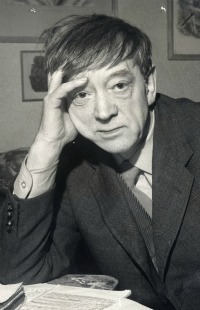 W. H. Auden regarded The Anathemata as "one of the most important poems of our time", and called it in 1977, "probably the finest long poem in English" of the twentieth century. In 1962 Igor Stravinsky considered Jones "perhaps the greatest living writer in English", and in 1964 Herbert Read called him "one of the greatest writers of our time". In 1974 he was made a Companion of Honour. Following his death in 1974, Jones reputation declined. Artists who engaged with history and myth were not considered to be in tune with the times, either in poetry or art. Literary references in painting were anathema. A number of major exhibitions of David Jones paintings were mounted as part of the commemorations associated with the centenary of the First World War, in particular Vision and Memory at Pallant House in Chichester. At the same time much of his poetry was reissued, and subsequently a rapid reassessment has taken place, with new generations discovering his work. The impact of British television documentaries about the War Poets also brought his work to wider attention, in particular War of Words: Soldier-Poets of the Somme, which was broadcast on BBC TV, with a narration by Michael Sheen. Since 2014 Jones reputation has soared and he is again being recognised as one of the most original and important poets and visual artists of the 20th century. ^ Michael Symmons (28 September 2002). "Poetry's invisible genius". The Telegraph. Retrieved 22 May 2017. ^ The Art of David Jones, Vision and Memory. Ariane Banks and Paul Hills. Lund Humphries 2015, p. 13. ^ a b c Thomas Dilworth (2012). David Jones in the Great War. Enitharmon. ISBN 978-1-907587-24-5. ^ a b Peter Salmon (1 May 2017). "Private David Jones's In Parenthesis and The Anathemata". Cordite Poetry Review. Retrieved 3 May 2017. ^ The Art of David Jones, Vision and Memory. Ariane Banks and Paul Hills. Lund Humphries 2015, p. 16. ^ The Art of David Jones, Vision and Memory. Ariane Banks and Paul Hills. Lund Humphries 2015. pp 16–18. ^ a b Andrew Wilson. "Artist biography, David Jones, 1895–1974". Tate Etc. Retrieved 14 November 2016. ^ The Art of David Jones, Vision and Memory. Ariane Banks and Paul Hills. Lund Humphries 2015. pp 63–72. ^ The Art of David Jones, Vision and Memory. Ariane Banks and Paul Hills. Lund Humphries 2015, p. 88. ^ The Art of David Jones, Vision and Memory. Ariane Banks and Paul Hills. Lund Humphries 2015, pp. 135–36. ^ The Art of David Jones, Vision and Memory. Ariane Banks and Paul Hills. Lund Humphries 2015, p. 164. ^ a b Rowan Williams (25 March 2017). "Everything is illuminated: Rowan Williams on the art and faith of David Jones". New Statesman. Retrieved 1 April 2017. ^ The Art of David Jones: Vision and Memory, Ariane Bankes and Paul Hills, Lund Humphries, 2015, p. 164. ^ Michael Prodger (4 December 2015). "The practical yet mystical magic of David Jones". New Statesman. Retrieved 13 November 2016. ^ Matthew Sperling (3 October 2015). "Time is Ripe for a David Jones Revival". Apollo. Retrieved 22 May 2017. ^ Mark Sheerin (27 October 2015). "Rediscovering genuis:David Jones at Pallant House and Ditchling Museum of Art + Craft". Culture 24. Retrieved 22 May 2017. David Jones, Paul Hills (Editor), Tate Gallery, 1971. The Engravings of David Jones: A Survey, Douglas Cleverdon, Clover Hill Editions, 1981. Dai Greatcoat, a self-portrait of David Jones in his letters, Rene Hague (editor), Faber, 1980. David Jones: The Maker Unmade, Jonathan Miles and Derek Shiel, Seren, 1995. The Long Conversation, a Memoir of David Jones, William Blissett, Oxford, 1981. In Search of David Jones: Artist, Soldier, Poet (2008) First documentary in a trilogy exploring Jones's early artistic development, his time in the First World War trenches and his becoming a poet. David Jones Between the Wars: The Years of Achievement (2012) Second documentary celebrating Jones's artistic and literary achievements during the interwar years. David Jones: Innovation and Consolidation (2014) Final documentary exploring Jones's life and work from the Second World War up to his death in 1974.